Insulation. Check around your home for water supply lines that are in unheated areas and make sure they are insulated. These areas include the basement, crawl space, attic, garage or under kitchen and bathroom cabinets. Hot water pipes and cold water pipes that are not allowed to drip in this areas can both freeze. When below freezing temperatures are forecasted, make sure your open all cupboard doors in kitchens and bathrooms where pipes are located. Check for leaks. Leaks should always be fixed right away. Check for leaks in all of your faucets in the kitchen, bathrooms, laundry room etc. Put away your hoses and close your outdoor shut off valves. Interior shut off valves leading to outdoor faucets should be closed and drained. Any water left in the lines that freezes could cause major damage. Wrap up and pack away any connected outdoor hose until warm weather arrives again. 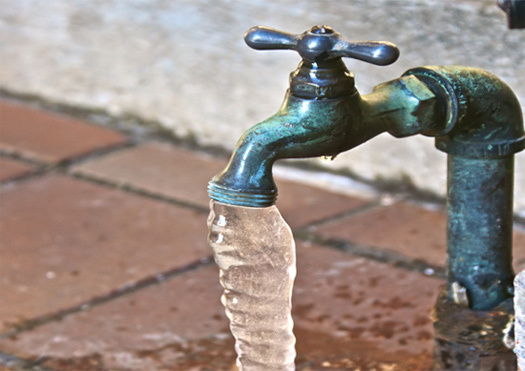 Any water left inside that freezes can cause the hose to expand causing major damage to your faucets. Locate your main water cut-off valve for your home. Damage can be minimized if you turn off your main water valve quickly. Usually located close to where your water line enters your home. You will also need to locate your main water valve and shut it off in case you are vacating your home especially if your home heating system is not working. Unfortunately, if you do end up having leaky pipes due to the current extreme cold, call us right away! We know what to do to help you avoid further complications such as burst pipes or water damage.